Mattison, Henry K. (Civil War veteran - grave located) Henry K. Mattison enlisted in the Union Army as a private on 11 March 1865 at Syracuse, New York at the age of 30. He was mustered into E Company of the 193rd New York Infantry at Albany. During the unit's ten months of service, Mattison received two promotions to 1st Sergeant and Captain, before being mustered out on 18 January 1866 at Harper's Ferry, West Virginia. 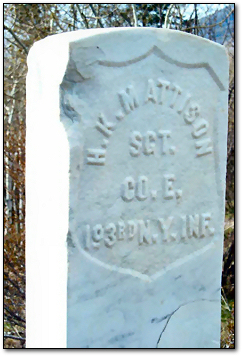 Mattison died in Aspen on 10 March 1885 and was buried in Ute Cemetery. Henry's gravestone was broken in half and has been restored. 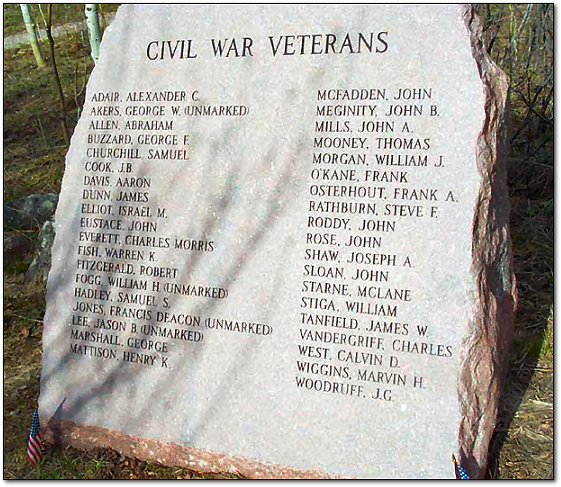 His grave is situated on what many call War Hill in that there are many Civil War veterans buried together and they appear to be in formation. Mattison, Henry K. Union, 193 N.Y. Infantry, Co. E, Rank In Pvt., Rank Out Capt. Organized at Albany, N.Y., and mustered in by Companies as follows: "A" March 6, "E" March 28, "K" April 7, "C" March 14, "D" March 28, "G" April 9, "H" April 3, "I" April 9, "B" March 16, and "F" March 28, 1865. Left State for Shenandoah Valley, Va., by detachments March and April, 1865. Attached to 3rd Brigade, 3rd Division, Army of the Shenandoah, to July, 1865, and District of West Virginia to January, 1866. Duty in the Shenandoah and Dept. of West Virginia. Mustered out at Harper's Ferry, W. Va., January 28, 1866. Regiment lost 25 by disease during service.